We are faced with challenges every day. We also faced with a choice of how we respond to these challenges. Today I had a slap in the face reminder of how, even when faced with the worst hand a parent could ever be dealt, there are people that choose to seek the positives… there are people that choose to Dance in the Rain. Lilee-Jean was born 5 days before my girls in late 2010. She started her life just like every other child… but 10 months later, something horrible started to grow inside her little developing brain – a tumour called Gliobastoma (GBM). For the next year and a half, Lilee and her family did every treatment they could to beat this awful disease. Although the chances of winning were very low, they kept fighting… After months and months of treatments and battles, they started to feel like they had a chance of beating this tumour. …Andrew [LJ’s father] and I have compiled a realistic, relatively short and doable list, not only to fill Lilee-Jean’s life to the brim with love, laughter and magic, but to keep ourselves focused on our now and not our later. We have chosen to call it “Dancing In The Rain” in stead of a “bucket” list for obvious reasons, and if time allows, we will hopefully be adding to it as we cross things off. There is no better way to fight disease and to fight death, than to live. So when we finish our last few stomach churning, heart wrenching “to do’s” they will be put aside, and left to gather dust until the time comes for them to rear their ugly heads… IF that time does come. One of the items on the list was “go to school”. Because of Andrew’s ties to our community (he attended our school years ago and is very well know in Agassiz), LJ’s story has grabbed and wrenched the hearts of many of us in Agassiz and at Kent School (I wrote about this here after she came to visit us following surgery). Both our kindergarten teacher (Stacey Garrioch @garrioch) and I reached out to the family to offer LJ a chance to spend her first day at school with us. Andrew and Chelsey agreed that this would be a great fit so this morning, we welcomed our newest student to Kent School. 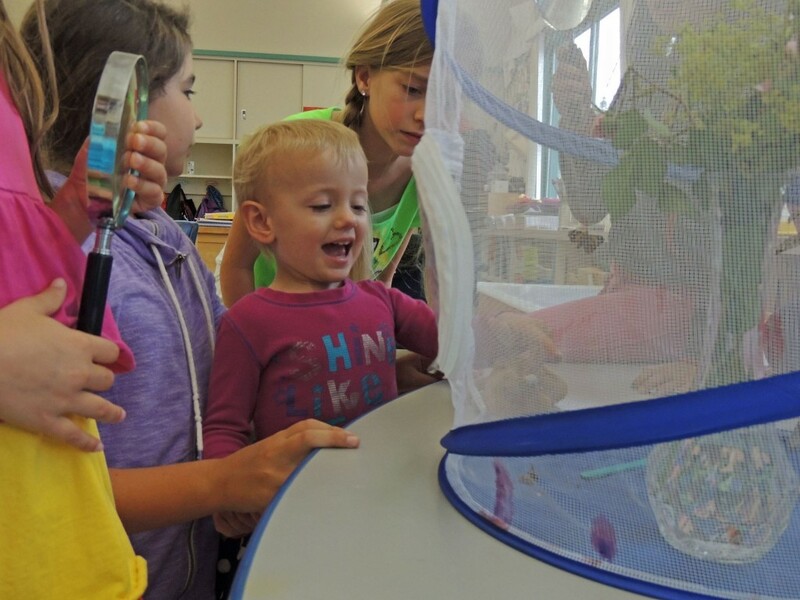 Stacey set the day up as a typical day filled with tons of play-based learning for Lilee-Jean and her classmates. As with every new member of the class, the students were so excited to meet and play with LJ – who showed up with a big smile and her “lucky bear” and new Tinkerbell lunch box. She hung her coat up on the hook with her name on it, met her buddy and sat down and joined the class. She was, of course, one of the VIPs so this meant she led some songs, shared calendar time, and told us all about the weather. She was a real Kent student in Division 10. I think the best part of the day was when I walked in to check in to see how things were going and I couldn’t see Lilee-Jean; she completely blended in and was just ‘one of the kids’ playing in the house centre. She was busy feeding her baby with two other students like any typical kindergarten student would be doing. The other times I popped in to take in the moments, she was either pointing out the L in a puzzle and saying this stood for Lilee-Jean, eating her snacks with her classmates at the table, writing on the white boards, or dancing the Gummy Bear Dance with her friends. I did not want this day to end but I knew she was a typical two year-old and needed her afternoon nap. I didn’t want this day to end because I wanted to continue to be able to pop in and see Lilee-Jean bringing joy to all of us by just being herself in her first day of school. I imagine this is what Andrew and Chelsey go through almost every moment of their lives… and unfortunately, the moments must fly by. 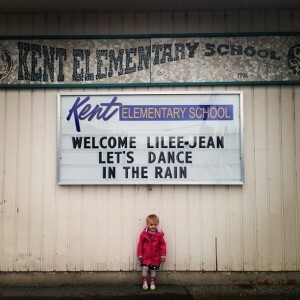 At noon, Lilee-Jean had her lunch and hung out and played with her classmates. 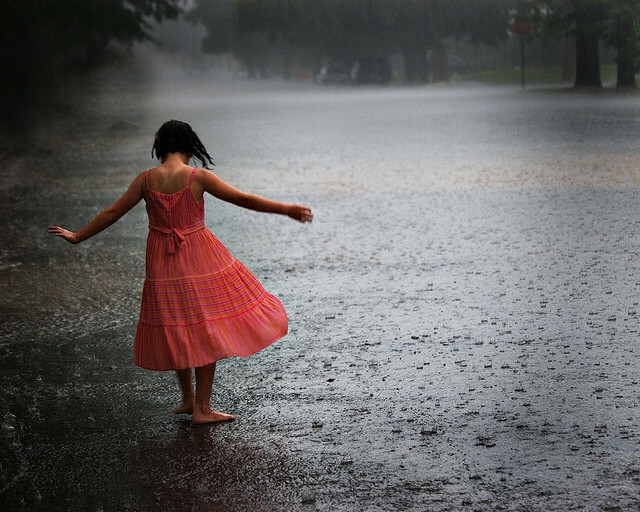 She then gave every child and adult a big warm hug and left school with a huge smile as she danced in the puddles and caught the rain drops in her hands. Tonight she will have a girls night as she and her mommy go to a spa and a hotel to continue their dancing in the rain. As I sat in my office to collect my thoughts, I wondered: when faced with life’s challenges, do we look through the lens of all the problems we cannot change? Or do we choose to change the lens and see all the wonderful moments life has to offer and dance in the rain? Andrew and Chelsey are going through what every parent fears. They CHOOSE to embrace the life they have with their beautiful daughter, Lilee-Jean. Because they choose to do this and choose to share their story, I am forever changed. Lilee-Jean may not live on forever but all that she and her family have taught me about life and love will live on through me and so many others that have been touched with their story. Thank you so much to LJ, Andrew, Chelsey for sharing today with us. Thank you for letting so many of us into your lives through the window of social media. Thank you for inspiring me and so many others. Thank you for Lilee-Jean for allowing me to spend the most beautiful morning dancing in the rain. Please support this family by going to Chelsey’s blog here and liking Love For Lilee on Facebook. My daughters sang a song they love and one that I know means a lot to Lilee and her parents. Have a look at the video below or view it here. Brought tears to my eyes, what a wonderful thing you and Stacey did for this family. An amazing story in so many ways. Chelsey and Andrew, not everyone would open up their lives the way you have and not only allowed, but encouraged others to share your journey with you. Your family continues to inspire all of us and to remind us, once again, to enjoy every moment of every day. Chris and Stacey (and all the students and staff at Kent School), you too are an inspiration. While you welcomed Lilee-Jean into your school I know that you do this every day with every student who walks into that building. Love all of you! What a beautiful post and amazing day and gift to LJ and her family. This family inspires me and makes me remember the importance of Dancing in the Rain. I was so honoured to welcome Chelsey and Lilee to our spa today for mother daughter mani/pedis after they left schools today! What a LOVELY mother and daughter! I cannot express enough my admiration not only for Lillee – she is just an adorable little doll, but for Chelsea – I’m a mom, and tonight after spending hours wanting to scream at God – ,Why, WHY take that beautiful little girl? I’ve not been able to hold it together! HOW? HOW does Chelsea hold herself together with such humbling grace? As I sit here typing, I understand, her love, a mothers love cannot allow her to be broken just yet – her baby needs her , she needs happiness and carefree giggles – so chelsey smiles and she laughs! I pray no parent should ever have to walk the road this beautiful young woman has- but should we ever, we should be biessed to walk that crippling road with such awe inspiring grace and love as chelae a is for her Lilee! I was hoping to hear how the day went. This family and community have been so amazing, giving LJ such an incredible life, giving her opportunities to experience so much. I don’t know how they find the strength but they continue to do so much with her and for her. You and your school ‘family’ were so lucky to be able to share her first day of school with her. It sounds like it was a fun day for her. Chris, you found a way to express what many of us have felt but couldn’t articulate. This was just beautiful! Thank you! What a beautiful tribute to this incredible family. Thank you for sharing Lilee’s story and for reminding us all to take notice of the precious gifts right in front of us. I’ve been meaning to read this post for a few days and now I have. 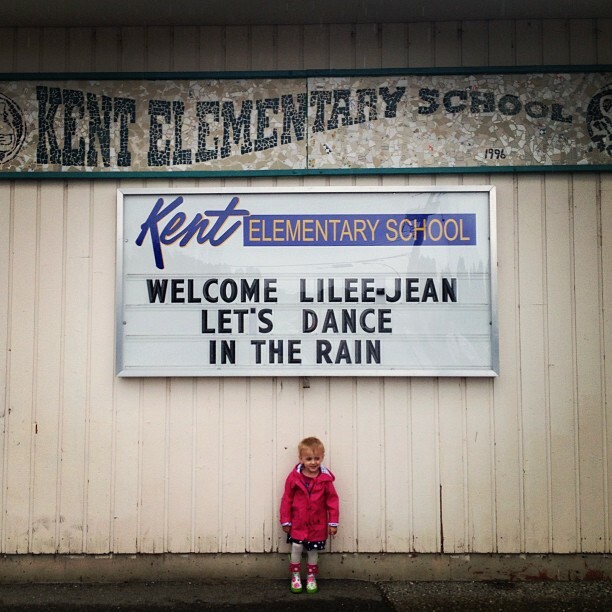 This post says so much about LJ’s family, their friends, and the greater community of Agassiz. Kent School is full of big hearts and I’ve been so proud to be a part of it for ten years. LJ had a wonderful day at school. I can see that. It is wonderful how the family is really living her days left with her and will have a lifetime of memories as a result. Such a hard thing for them to go through, but the way they have chosen to do it is very beautiful and moving.